Fictional British spy George Smiley featured in some eight books written by acclaimed author John Le Carré (sometimes as the main protagonist, sometimes as a side character) and is about to appear in a ninth, A Legacy of Spies, which comes out in September. And that’s not to mention his appearance on small screens and large where he’s been portrayed by everyone from James Mason and Sir Alec Guinness to Denholm Elliott and Gary Oldman. 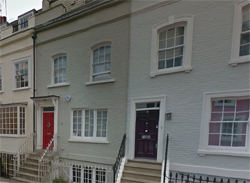 In the books, Smiley and his wife, Lady Ann, lived at a number 9 Bywater Street in Chelsea – which is an actual address, just off King’s Road (pictured with the red door). The Georgian townhouse was appropriately used to depict his home in the 1979 BBC series of Tinker Tailor Soldier Spy although, interestingly, while number nine’s exterior was used, it was apparently number 10, next door – pictured here with the blue door – which provided the interiors. Le Carré, who was living just over the Thames in Battersea at the time of Smiley’s creation, has reportedly said he chose the location because his literary agent lived nearby (although there is apparently a little fuzziness on whether this is the case) and the mother of one his pupils from Eton (Le Carré – actually David John Moore Cornwell – taught at Eton for two years before he joined MI5 in 1958) lived in the street. But perhaps the best literary reason is the fact that Bywater Street, despite the name, is actually a cul-de-sac which adds to the difficulty of anyone trying to spy on Smiley. A wise choice for a spy’s residence, in other words. Other locations associated with George Smiley in London include The Circus, the secret London intelligence HQ where Smiley and his fellow intelligence operatives worked, which was located in an office block in Cambridge Circus, on the corner of Charing Cross Road and Shaftesbury Avenue.